The teaching equipment for thermoelectric devices is an all-in-one laboratory set. It represents the perfect solution to complement the teaching of the thermal and electrical behaviour of thermoelectric devices both as power generators (Seebeck effect) and as heat pumps (Peltier effect, either heating or cooling). Mechanical assembly comprising of a high-power resistor (heater), heat exchange plates and an efficient fan-cooled heat sink. Two thermistors are used to measure the temperature on the sides of the thermoelectric device. Heater controller unit to vary the power supplied to the resistor. Mains powered. It shows voltage / current / power and the temperature of the heater. Fan controller unit to control the fan speed. Mains powered. The fan is a 4 wire Intel-spec unit and the controller allows adjustment of the fan’s speed and reads back the tacho frequency. The fan-side thermistor temperature is also shown on the display. Low-power version of the RO2 I-V tracer and at-load tester. This unit is used when the thermoelectric device is acting as a power generator. 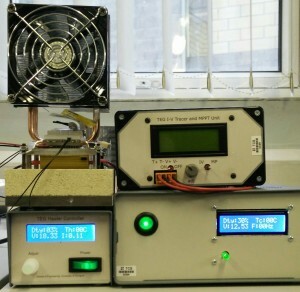 The teaching equipment for thermoelectric devices does NOT include a power supply to use the thermoelectric device in heat pumping mode, which can be purchased through TCS. Alternatively, a power supply capable of providing at least 12V / 3A can be used. Investigations of heatsinks, heatpipes, the effect of fan cooling, thermal resistances, etc. and how to model thermal circuits. Seebeck power generation. Plotting I-V curves, maximum power point, constant heat behaviour, changing thermal conductance of the TEG with load current, etc. Maximum temperature is greater than 100°C. Peltier cooling. Heat pumping, plotting Qc and CoP curves, parasitic Seebeck effect, investigating Vmax, Imax and Qmax. Minimum temperature should be limited to 3°C. A full set of student notes and a set of demonstrator notes are available on request. They show the typical results obtained for each of the these experiments.